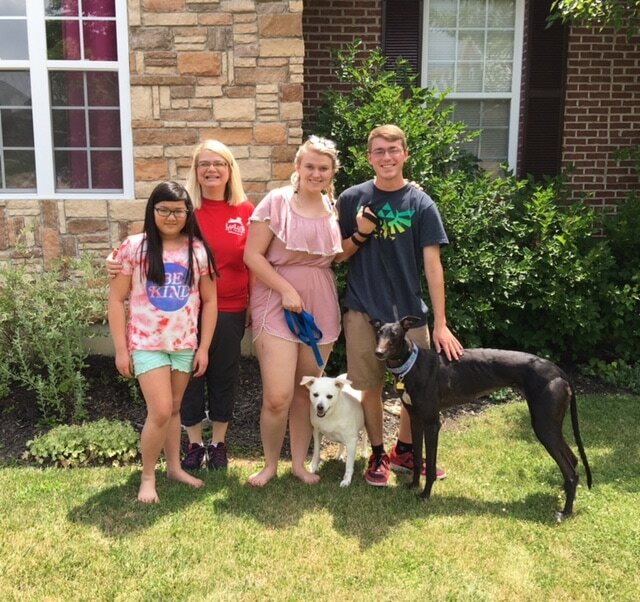 ​Hotfoot Jessie J went HOME today in Burlington, KY. Hannah has wanted a greyhound for 8 years and now that she is engaged to Bradley the timing seemed right. When Jessie, NOW Nova met Hannah, she gave out LOTS of kisses and Hannah knew she was the perfect dog for her. They have a sweat white lab mix, Sophie who took a minute to greet Nova, they will be good friends. Her mom, Melissa and sister Gabrialla are also pictured. Mom fosters for a rescue group in Burlington, so obviously the entire family loves dogs! I think Nova will be a nice addition and perhaps help out some of the new foster dogs she brings home.